Can you imagine Stephen Curry being suspended for the Warriors' season opener on Tuesday? It could have happened, but won't, according to Yahoo Sports' Chris Haynes. Why might Curry have been forced to sit out on the night he collected his third NBA championship ring? With just under nine minutes left in the preseason finale on Saturday night, Warriors back-up point guard Quinn Cook fouled Lance Stephenson with some authority. The Lakers forward too exception and looked like he wanted to start something with Cook. 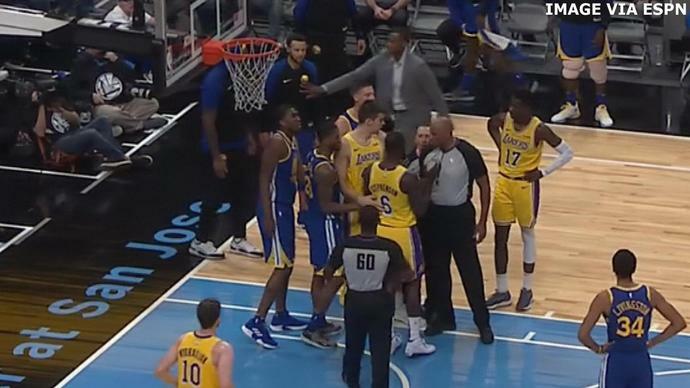 The referees were able to intervene before anything could happen, but Curry and injured center DeMarcus Cousins, who were sitting on the sideline, sprung to their feet and walked towards the group of players on the court. It looks like they got within a few feet of the players before Warriors assistant coach Jarron Collins put a hand on Curry's chest and pushed them back. Per league rule, any player not in the game that steps on the court during an altercation is subject to a suspension. But according to Haynes, the league didn't deem the incident between Cook and Stephenson to be an altercation. So Curry and Cousins weren't in violation of league rule. So rest easy Warriors fans. Curry will play on Tuesday night against the Thunder.